Nintendo Direct is a series of online presentations hosted by various staff members of Nintendo several times a year to make announcements about various subjects across the company. On several occasions, Splatoon games have been mentioned on this series. During this presentation, Splatoon was announced to be released. A trailer, featuring various multiplayer aspects, was shown, as well as a short interview with Tsubasa Sakaguchi, Hisashi Nogami and Yusuke Amano in Japanese. Various elements in this trailer were either altered, or not included in the final version of the game. During this presentation, the first trailer of Splatoon's single-player campaign was shown. It debuted various types of Octarians, and showcased many levels. 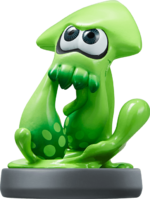 During this presentation, the Splatoon amiibo series was announced, as well as the release date of the game. A few weeks before Splatoon's launch, a Nintendo Direct specifically about it was made. This presentation went into detail about various aspects of the game, some of which had never been seen before. During this presentation, Version 2.3.0 was shown off, including the new gear. Two new stages, Museum d'Alfonsino and Mahi-Mahi Resort were shown. During this presentation, Version 2.6.0 was announced, and many new weapons in the Sheldon's Picks range were announced. Fully revealed Splatoon 2 as a sequel after being previously teased. Showed off the new Splat Dualies, Sub weapon and Special weapons, the new hub world and hinted at a new single-player campaign. Also showed off various ways Splatoon 2 could be played. During this presentation, Splatoon 2 had its release date announced, as well as a preview of Salmon Run. A new line of amiibo were announced, as well as confirming that the previous figures would be compatible. However, their functionality was not confirmed. A trailer for Splatoon 2's single player campaign was shown, and the final chapter of Squid Sisters Stories was released afterwards. New themed accessories were also shown off, such as Splatoon-themed Joy-Con, Switch Pro Controller and carrying case, as well as new bundles. These were not announced in the North American and Australian Directs. This presentation briefly talked about the Splatoon 2: World Inkling Invitational that was being held at E3 that year. This Direct looked at the new customisation options, the new shops and their owners, Murch, new Gear, amiibo functions, provided an overview of the modes Regular and Ranked Battle, and revealed League Battle. It also included further details on Salmon Run, Octo Canyon and Splatfests, the reveal of Off the Hook and SplatNet 2, the announcement of upcoming content updates, including the Splat Brella and the Bubble Blower, and the announcement of the Splatoon 2 Splatfest World Premiere Demo. Revealed that Kelp Dome was returning on 15 September 2017, while Snapper Canal and the Tenta Brella were revealed as coming in further updates. Showed contents of Version 3.0.0, including 100 new pieces of Gear, Rank X, new stages such as Piranha Pit, Camp Triggerfish, and Wahoo World and Callie appearing in Octo Canyon after finishing the story. Showed off the reveal trailer for the Octo Expansion and the reveal of a new Super Smash Bros. game in which Inklings will debut as a fighter. Showcased various elements of the Inkling's moveset in Super Smash Bros. Ultimate and revealed the Squid Sisters as a new Assist Trophy.